A relative of Afghan President Hamid Karzai has been mistakenly killed by Nato troops in southern Afghanistan, officials say. 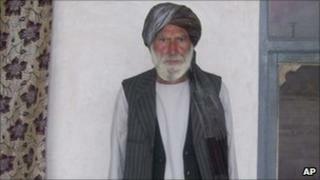 Yar Muhammad Khan was at his home in Dand district near Kandahar city when he was shot dead in an overnight raid. Nato says it is investigating the incident. Hundreds of Afghans took to the streets of the capital, Kabul, last week to protest about civilian deaths at the hands of foreign forces. ''There were operations taking place near his house. He was killed by mistake. He was not a target," Ahmad Wali Karzai, the brother of President Karzai and head of Kandahar's provincial council, told the BBC. It comes just days after President Karzai lashed out at US-led forces over the recent accidental killing of nine boys in eastern Kunar province. US President Barack Obama, Gen Petraeus, the commander of international troops in Afghanistan, and US Defence Secretary Robert Gates have all apologised for the incident. The man killed on Thursday does not appear to have been a close relative of Hamid Karzai. He has been described by various sources as a cousin of President Karzai and a cousin of his father's. However, President Karzai's spokesman said that the president knew the man and that they came from the same village. "He was extremely sad, just as he's sad over any incident that takes the life of any innocent Afghan civilian," Waheed Omer said. The president "once again calls on Nato forces to avoid killing civilians," he is quoted by the AFP news agency as saying. Mr Khan is thought to be a farmer between 60 and 65 years old. He is reported to have left the house at night carrying a weapon. The BBC's Quentin Sommerville in Kabul says it is not unusual to carry weapons at night in such volatile areas, especially for those in the Karzai clan. However, reports say he was spotted by the Nato team with a weapon and shot dead. A record number of civilians were killed in Afghanistan last year. More than 2,700 civilians were killed in 2010 - up 15% on the year before. A UN report on civilian deaths said that the Taliban were responsible for 75% of all deaths. The numbers killed by Afghan and Nato forces fell, accounting for 16% of civilian deaths. Nevertheless the issue of civilian deaths is highly sensitive in Afghanistan. Our correspondent says that public anger over the deaths of the nine boys in Kunar shows that the deaths of Afghans by foreign hands provokes greater outrage than killings by the Taliban. In 2009 Gen Stanley McChrystal, the former commander in chief in Afghanistan, made reducing civilian casualties a priority for coalition forces. Analysts see this as a critical year for the conflict: fighting is expected to get worse and human rights groups fear that the Taliban are becoming more brutal. They say civilians will continue to be caught in the middle, with even higher casualties expected in the year ahead. Kandahar province, where Mr Khan was killed, is the spiritual homeland of the Taliban and is a key focus of the coalition offensive to drive out insurgents.